I have had my D800E for about two years. It can give incredibly sharp results with good lenses, but too often images didn’t seem as sharp as they could be. I always blamed myself. I used a tripod, a cable release, mirror up. I made sure that the auto focus spot was right on that eye or other focus point, and the little round dot said it was focused. Well it still wasn’t focused…or my fault. The autofocus calibration was off. Tam Le from the mid-Atlantic PSA gave a talk on bird photography back in July at the Baltimore Camera Club and he emphasized the need to check your focus calibration. 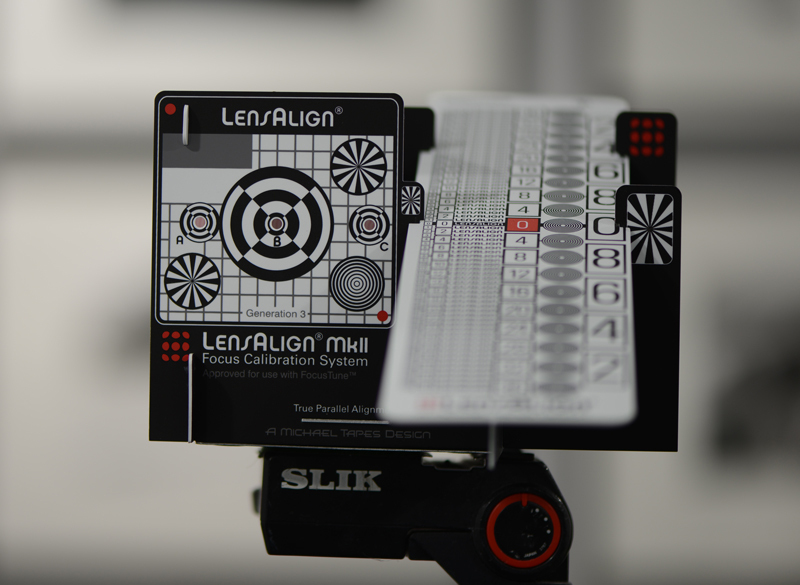 I finally bought a Lens Align MKII Focus Calibration System (Lens Align) to check it. The calibration system was essentially two parts: (1) an alignment target to assure that the sensor was parallel to the device and (2) an inclined ruler to help you see the depth of focus. It seemed over-priced (about $90) for what it was, but it did show me that my camera consistently and significantly back focused with all of my lenses, i.e., instead of about one third of the depth of focus being in front of the focus point and two thirds behind the focus point, virtually all of the sharpness was behind the focus point. This did not happen when using Live View to focus. The D800E has an autofocus fine tune menu function that allows for some adjustment, but even at the maximum adjustment, the camera was back focused, so I decided to send it back to Nikon for adjustment. I have had the camera for more than a year, so it is out of warranty and it cost me about $250 at Nikon for the adjustment (which included a cleaning of the camera and sensor, and firmware update) and return postage. I insured it to send it in so add another $25 for my shipping. Happily, when I got it back, the focus calibration appeared to be right on. I haven’t yet gotten out into the field to really test it, but the Lens Align provides a good indication that my focus should be better from now on. If your autofocused shots seem to be a little less sharp than you think they should be, or the sharpest point isn’t where you thought you placed it, you can probably begin to check with just an inclined yardstick, with a narrow piece of tape across it. Put the tape across the ruler perpendicular to its length. Draw a line on the tape, focus on the tape. If the focused field isn’t about 1/3 – 2/3 in front and behind the line respectively, you may need to get your autofocus calibrated. If it is close, your camera may allow you to adjust (mostly higher end cameras have adjustment capability). If it is far off as mine was, you might consider sending it in for service. Update: It was so nice outside, I abandoned my family after Xmas breakfast and presents to shoot a little at Fells Point and test it out. After a moment of panic, in which nothing would focus, I realized the diopter needed to be readjusted (does your camera have an adjustment for your vision and is it properly set?) and when that was fixed everything was fine. Somewhat embarrassing that after all of the years I have been shooting I didn’t realize sooner that the autofocus was off. Many shots may have been better if I had. Realized when downloading that Nikon reset my file naming convention, color space and bit depth. Needed to reset.